Is increased production of natural gas from shale deposits good for the environment? At first glance, yes: natural gas releases less CO2 into the atmosphere than coal, so replacing coal-fired electrical plants with gas-fired plants is a win for global warming. And since fracking makes natural gas cheaper, it helps stimulate a switch from coal to gas. Also read about Obama’s new rules for fracking, see our natural gas timeline, and watch a music video that explains just what the frack fracking is. Less than a third of natural gas is used for electrical generation. Cheap gas will mean more consumption by buildings, industry, and perhaps for transportation. In many of these sectors, cheap gas won’t edge out coal or any other fuel. We’ll just burn more of it. Cheap shale gas will also make electricity cheaper, increasing consumption, which will chip away at the emission reduction from switching from coal to gas…Quantifying all this requires modeling the effect of unconventional gas on energy markets and emissions, which the International Energy Agency (IEA) recently did. Their report predicts that if these gas resources are widely exploited, globally, CO2 emissions in 2035 will only drop by 1.3%. 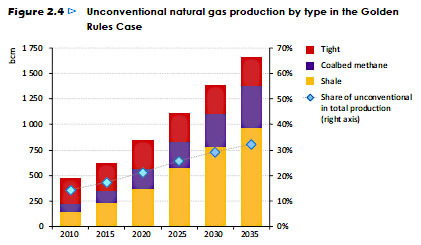 …In short, if we assume current policies, shale gas is almost a wash for global CO2, and methane will decrease or eliminate any small climate benefits of shale gas. If cheap shale gas crowds out renewables or increases energy demand more than IEA predicts, or methane leaks are worse than we think, cheap shale gas will actually hasten climate emissions, even in the short term (2035). Via email, McCabe tells me that the most important factor in the IEA model is crowding out: Cheap shale gas will reduce coal usage (good) but will also reduce development of new nuclear, wind, and solar power (bad). So this is your bad climate news for the day—to go along with shrinking Arctic ice, extreme weather, killer droughts, more wildfires, and monsoons increasingly inundating low-lying areas. Natural gas fracking may be good for North Dakota, but the evidence suggests that, in the end, it won’t do much of anything to rein in climate change. However, let’s end on a positive note. McCabe (and the IEA) come to their bleak conclusion only “if we assume current policies.” But those policies aren’t written on stone tablets. The IEA has a longish set of “Golden Rules” that could make fracking a better environmental bet, and McCabe highlights the two most important of them: (1) Eliminate leaks completely from the natural gas production process, and (2) use carbon sequestration to substantially reduce carbon emissions from gas-fired electrical plants. If we really are going to drill, baby, drill—and all the evidence suggests we are—these two things should become our touchstones for doing it responsibly. Will Obama’s New Rules Make Fracking Better for the Planet?